It was either February or March of 1952 when an Oklahoma City petroleum geologist named William Atkinson took the unusual step of getting an earthquake insurance policy for his house. Today, that seems a bit eerie in its prescience — in 2014, the state had more big earthquakes than California, and on Saturday it was rattled by its largest earthquake in the modern record, a magnitude 5.8. But consider this: The only reason anyone knows about Atkinson’s insurance policy is because his weird choice became newsworthy on April 9, 1952, when Oklahoma City rocked and swayed its way through an earthquake that might have been almost as powerful as the one last week. Eerie doesn’t cut it. In his predictive accuracy, Atkinson was downright unnatural. Or maybe he was just good at his job. Susan Hough, a seismologist with the United States Geological Survey, has studied the historical context surrounding Atkinson’s decision. In a paper published this year, she concluded that two factors could have led a person with Atkinson’s expertise to buy earthquake insurance. First, oil and gas extraction, even the old-fashioned, non-fracking kind, has the potential to shift the forces affecting fault lines. 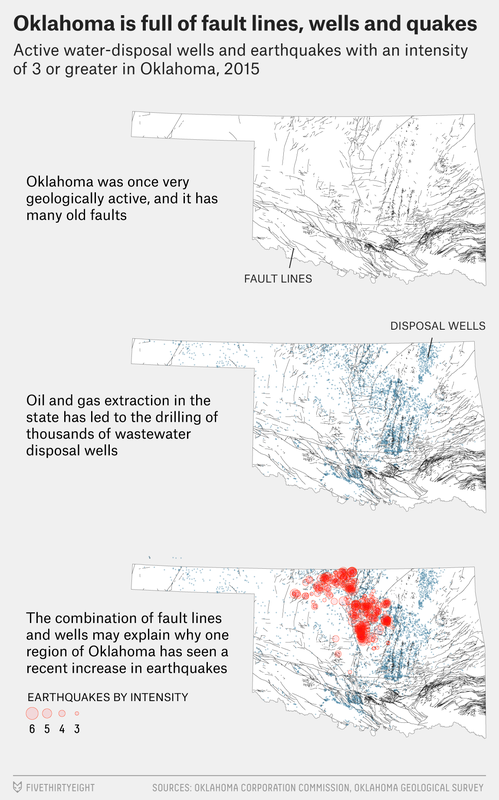 Second, Oklahoma is positively lousy with fault lines. There has always been a connection between petroleum and faults. Faults are places where the earth doesn’t quite align, like the planet buttoned its shirt up the wrong way. And the forces that create them also create pockets in the Earth that trap deposits of oil and gas. It makes sense that a place with a lot of one might also have a lot of the other, and the history of Oklahoma has been intimately connected to both. The first recorded earthquake there occurred in 1882, and the first commercially successful oil well was drilled in 1897 — both before Oklahoma was even a state. Today, it produces more natural gas than oil, but oil pump jacks are still a common sight, dipping and rising like great, beaked herons on roadsides, in random backyards, and — in the town of Barnsdall — literally in the middle of Main Street. Before 2008, Oklahoma had maybe a couple of earthquakes of magnitude 3 or greater each year, said George Choy, a research geophysicist with the USGS who studies human-caused quakes. In 2015, it had around 900. The evidence studied by scientists like Choy and Hough strongly suggests that this increase was caused by the practice of injecting wastewater from oil and gas extraction — both conventional and fracking — back into the earth. To understand why that is, and why those same scientists can’t tell you whether any individual earthquake was caused by the petroleum industry, you have to pay attention to the faults. Because of the way you learned geology in grade school, you may be used to thinking of faults as places where two of the tectonic plates that make up the Earth’s crust meet. The San Andreas fault, for instance, marks the spot where the Pacific Plate and the North American Plate shake hands, as they vigorously do from time to time. But faults exist in other places, as well. On our map, you can see an estimation of the known faults that crack the surface of Oklahoma like an overbaked cheesecake. “Any part of the crust has a bunch of faults in it that are old faults. They were created in past geologic times,” Hough told me. Oklahoma’s faults are tens or even hundreds of millions of years old, dating to times when the boundaries between tectonic plates were in very different places. “There’s a mountain range in southeastern Oklahoma, called the Ouachita, that was actually the remnants of an old collision zone,” Hough said. Now imagine one of the geologists suddenly starts making a lot more cash by working in the petroleum industry: The extra weight in her pockets could upset the balance. “Any time you inject or extract fluids from the ground, you can change the stress that’s existing,” Choy said. “Any human activity that changes stress in the earth might have the potential of causing an earthquake.2” The pressures shift. The equilibrium fails. Wastewater injection can do that. In fracking, people use pressurized water mixed with sand and additive chemicals to crack open small fissures in the rock and release trapped hydrocarbons. In conventional oil and gas extraction, water is often trapped alongside the resources we want and comes up with them — contaminated by those resources. The water is no longer potable, so companies try to inject it down below the water table. There are more than 10,000 wastewater injection wells in Oklahoma — and the state’s 2015 earthquakes cluster right on top of some of the wells, which are on top of some of the faults. But there are a lot of other faults and wastewater wells that aren’t associated with earthquakes. There are a couple of reasons for this. First, our map doesn’t represent all the faults in Oklahoma. It’s just an interpretation of the known fault segments, and some faults may be hidden. Second, the orientation of the faults seems to matter, Choy told me. The most likely places for human-made earthquakes are faults where the stresses are additive — where the naturally occurring pressures and the human-made pressures are pushing the fault in the same way. The map shows that the most-active faults in Oklahoma are oriented in a different way than the silent ones. And that helps answer another interesting question: Why isn’t North Dakota shaking, too? North Dakota produces way more oil than Oklahoma, and most of that is through “unconventional” methods — meaning it’s extracted via fracking. Consider the map again. Mapping faults is expensive and time-consuming, and the people who have the most money and time to devote to it — oil companies — often keep the information to themselves. The Oklahoma fault map uses a combination of data in published scientific papers and data the oil and gas industry shared with the Oklahoma Geological Survey. It was created in 2015. The increased shaking prompted the industry to share fault data with scientists, Choy said. Researchers still don’t know much about the faults in North Dakota. But what they do know about that state’s geologic history suggests that its faults would be very different from those in Oklahoma. The heart of North America is part of a craton, Hough said — a chunk of crust that’s been stable and far from plate boundaries for a really long time. While what is now Oklahoma was colliding and folding, uplifting and collapsing, the future North Dakota was sitting around twiddling its thumbs. That difference could mean that the faults there are oriented in different ways, which could allow wastewater to be injected, shifting the stress in the system, without upsetting the equilibrium — or at least without doing so yet. Gas production is measured in barrel equivalents. It could also be that North Dakota is just injecting a lot less wastewater than Oklahoma. The most recent data that’s publicly available on this comes from 2012. It shows North Dakota producing significantly less wastewater per barrel of oil equivalent than Oklahoma. Less wastewater produced means less wastewater injected. What accounts for that difference? The 2012 report credited fracking — in several states, fracking produced significantly less wastewater than conventional extraction, and North Dakota’s production was mostly fracking-based.3 There’s also evidence that older oil and gas wells — like the kind you’d find in a state like Oklahoma, which has a long history of drilling — produce more wastewater than newer wells, such as North Dakota’s. Short answer: Again, it’s all about the rocks beneath our feet. Because the history of earthquake monitoring in Oklahoma has coincided with the history of oil and gas extraction in Oklahoma, Hough thinks it’s impossible to know the natural background rate of earthquakes in the state. “I don’t think there’s clear evidence for tectonic [that is, natural] earthquakes in the state in the 20th century,” she told me. Choy, however, says this idea is still controversial among scientists. Earthquakes have also struck after people built large dams, creating reservoirs of water that significantly shifted the pressure on faults. China’s Three Gorges Dam is probably responsible for a 30-fold increase in seismic activity in the area. This is your regular reminder to not get too hung up on fracking as The Big Bad. The problems are more complex, and broader, than that.